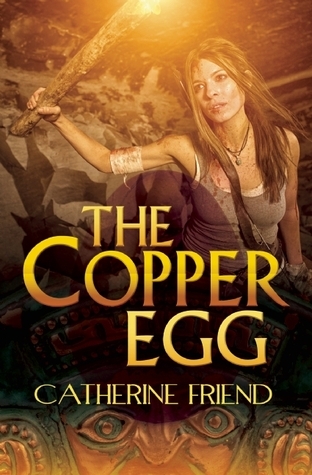 The Copper Egg by Catherine Friend is a modern day Indiana Jones style adventure. The cornerstones of this book are two intelligent leading ladies, an evil villain who is hell-bent on destroying everything in his path, and dazzling historical facts. An action packed adventure set in beautiful Peru. Claire Adams is archeologist that is currently working for a subsidiary of the Smithsonian. Her job is making sure priceless artifacts get properly labeled and protected as they are loaned out to other museums. Claire is bored out of her ever loving mind. This is a far cry from her days working as the sub-director of excavation at Chan Chan in Trujillo, Peru. A crazy turn of events and a bad breakup caused Claire to flee Peru, leaving her life and her heart behind. This all changes when a package of three Peruvian artifacts show up addressed to her. Sochi Castillo is Claire’s ex. Sochi lives a double life. By day she is a well-respected assistant for Centro Nacional de Tesoros Peruano, CNTP, working to keep Peru’s treasures in Peru. At night Sochi steals the very artifacts she protects at CNTP. Sochi goes by her hides her thievery behind the legendary La Bruja sin Corazon, the witch without a heart. Sochi has been given the job to steal the artifacts before other looters can get their hands on them and funnel them outside the county. Sochi justifies her actions as La Bruja by selling her stolen items to collectors that live in Peru. This is a double edged sword that Sochi lives by, but she struggles with her actions. The Copper Egg has a bit of everything, adventure, kidnapping, double crossing frenemies and of course a romance. I loved the concept of this book, and I was memorized by the stories and history of Peru. Put Peru down as one of the places I must travel to! The only thing that this book didn’t have going for it, in my opinion, is the romance. Claire and Sochi never really reconnected to me, and I never really felt their anger or angst at their breakup either. Their interactions together are a bit limited and I just couldn’t buy into their rekindling. All in all this is a good book and quite different from a lot of what is out there in this genre. It is well written and an action-packed adventure of fun. I look forward to reading more by this author.